Did you know that 1 in 10 pets have an underlying health problem with no visible symptoms? Regular checkups, vaccinations and screenings are part of preventive care, which is vital to detecting issues early, for healthier, happier pets. We know that you would do anything to make sure your furry friends are taken care of, but we understand that sometimes it’s hard to plan and budget for the preventive care your pets need. This is why we're pleased to announce, starting in 2018, Fredonia Veterinary Clinic will offer Preventive Care Plans! With low monthly payments, Petly® Plans, brought to you by IDEXX, make it easier than ever to give your pets the care they need. Fredonia Veterinary Clinic offers plans for your dogs, cats, and horses, with optional items to choose from to meet your pet's specific needs. What’s even better, Fredonia Veterinary Clinic Preventive Care Plans are good for your pet and your wallet, as they allow you to spread the cost of a year’s worth of preventative care into predictable monthly payments. Includes the preventative care exams, vaccines and boosters, basic lab tests, and deworming your puppy or kitten needs in their first year. 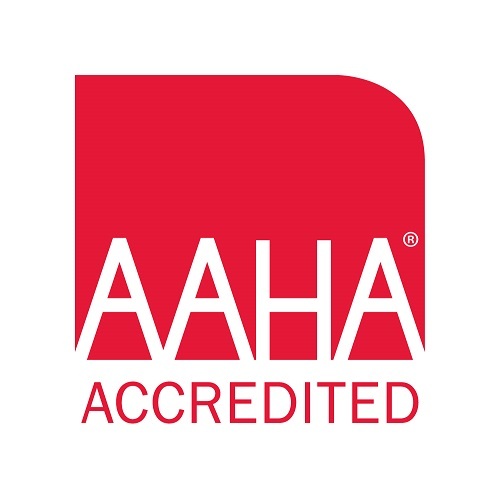 Includes the preventative care exams, vaccines, and screening tests your dog or cat needs to stay healthy during the prime years of life. Our most comprehensive plans, ensures we're looking for conditions that commonly affect dogs and cats in their senior years. All plans include a sick pet exam, to be used should your pet not be feeling their best between wellness visits. Choose from three great plans: Puppy, Canine Silver, or Canine Gold! Interested in a spay, neuter, or dental this year? Add on optional items to meet your dog's unique needs! Added bonus – Heartgard and Nexgard are available to plan members at last year's best pricing. That, along with a $50 prepaid Visa card from our supplier when adding 12 months of Heartgard and Nexgard, brings almost $100 in savings! Interested in a spay, neuter, or dental this year? Add on optional items to meet your cat's unique needs! Added bonus - all plans include an extra physical exam to be used should your cat not be feeling well between wellness visits. We’ve also included soft paws (nail caps) application or nail trims whenever needed! How do preventive care plans help? 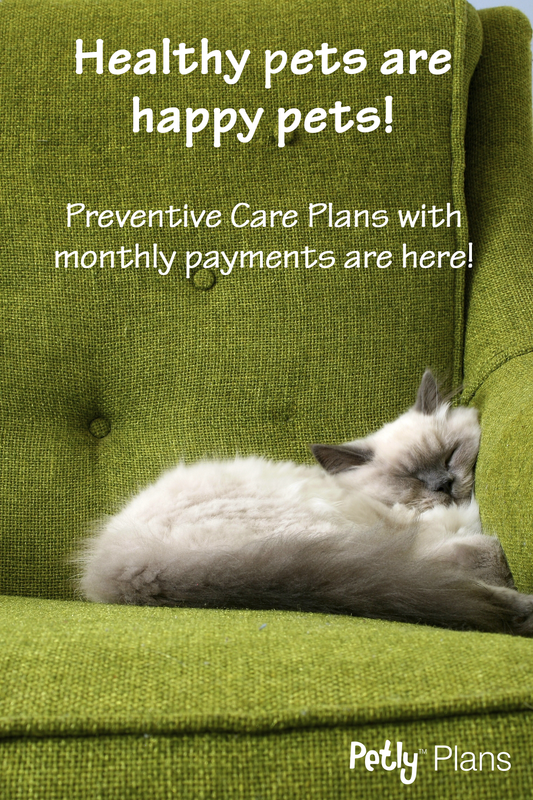 A preventive care plan, like Petly® Plans, will help you cover the cost of your pet’s basic needs through a budget-friendly plan that is customized by you and your veterinarian. How do I enroll my pet? 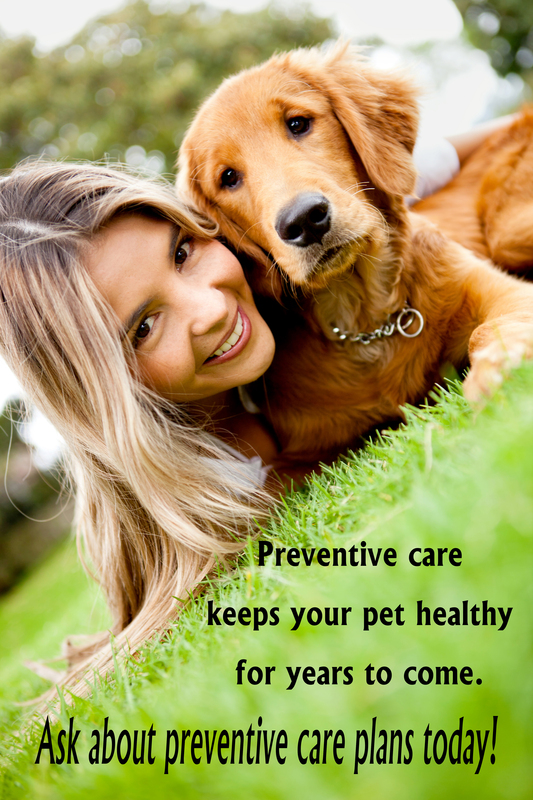 Talk to one of our team members about ensuring premium care for your pet by signing up for a Preventive Care Plan today!